Welcome to my blog. Today, I'm participating in the Denami The Sky's the Limit Blog Hop. I'm so excited to participate again this month! I love Denami Stamps and I thought these little Butterfly Stamps were just too cute. For this card I used Denami's Window stamp and Decorative Butterflies set. I colored the window with Copics and stamped the butterflies with Ranger Archival Inks. The decorative paper is from Tim & Beck for Studio Calico and the card stock and sentiment stamp color is Night of Navy by Stampin' Up. The sequins are from Pretty Pink Posh. Be sure to check out the rest of the participants on the hop and leave comments because 2 lucky commenters will receive a $20 gift certificate to the Denami Store. You have until 11:59 PM EST on Monday, May 19 to leave your comments and be eligible to win. Donna, I love your sequined flower box! Your patterned paper is simply perfect! Gorgeous card! Those little butterflies are adorable, aren't they!? Cute idea and fun sequins! Love window cards. This is adorable! This is a nice clean to the point card. Fits your sentiment perfectly. Donna this sis such a fun design! This is so adorable. I love the colorful window scene...and sequins...awesome touch! Love this card and the flat sequins along the window is really cool. love how you used the window stamp, too cute, thanks for sharing! 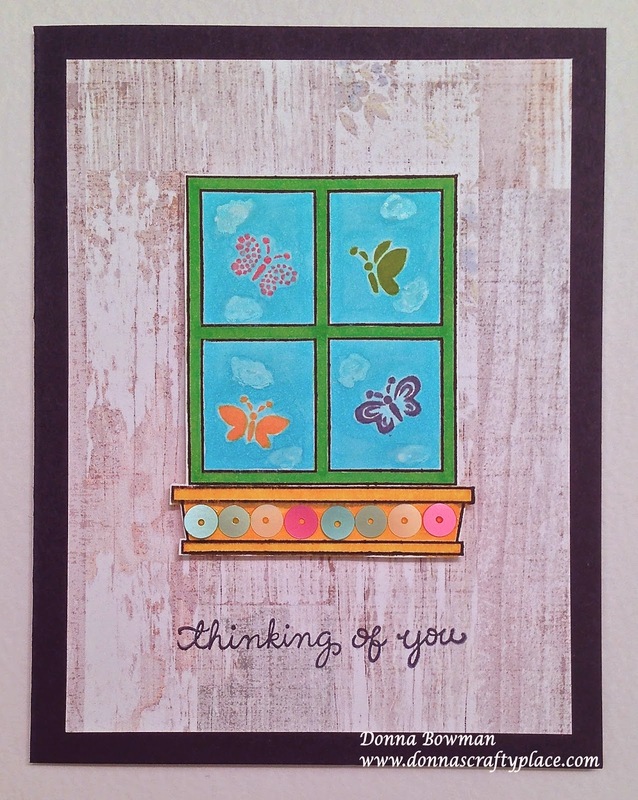 Very cute card, love the butterflies on the window. What a sweet scene you've created through that window, Donna! Great patterned paper backdrop too! very cute with the butterflies in the window. Perfect scene you have created! the idea of the window! Looking out the window was a brilliant idea. Very creative. The windows seen is perfect for this card! Thanks for the inspiration! So creative & beautiful, Donna! I love your card! Love looking out and seeing butterflies in my flowers. Adorable! I love the sequins across the bottom of the window...very sweet! Pretty card! Love the window and sweet butterflies! Fun bit of bling added with the sequins too! Cute little window scene! So happy you could hop with us! Your card is so pretty and fun too! Love the DP behind your window and those wonderful sequins you added! Cute card Donna! Love the butterfly stamps and the window stamp. Great job!! What a fabulous window treatment, I would love those butterflies at my window!